Spend 1/3 of the cost vs. Replacing or Refacing. So you want to renovate your kitchen? This is the center of your home. This is where hours of family time and guest entertaining magic happen. This is a focal point not to be taken lightly. You know you want a new stone countertop: marble, quartz, granite, etc. You know you want a new tile backsplash to give you a new sleek and fresh look. But what do you do with your cabinets? This is the question that stumps many, and where most mistakes are made when doing a high end kitchen renovation. This can cost you, the homeowner, several thousands of dollars, along with future headaches and disappointment of quality. Millions of homes today are filled with wonderfully built, solid wood cabinets. These get ripped out and replaced with foreign cheap particle board cabinets that deteriorate in as soon as weeks. Others will reface current face-frames with veneer materials that peel in weeks or months, and don’t even give a true impression of a solid wood cabinet, thus devaluing the quality of your cabinetry for the long-term future. Why not keep some or most of your current cabinetry, and transform them? You can get the same end-result of the desired layout and look you are going for. Give your wallet a break and save a huge chunk of change while having long lasting high quality. 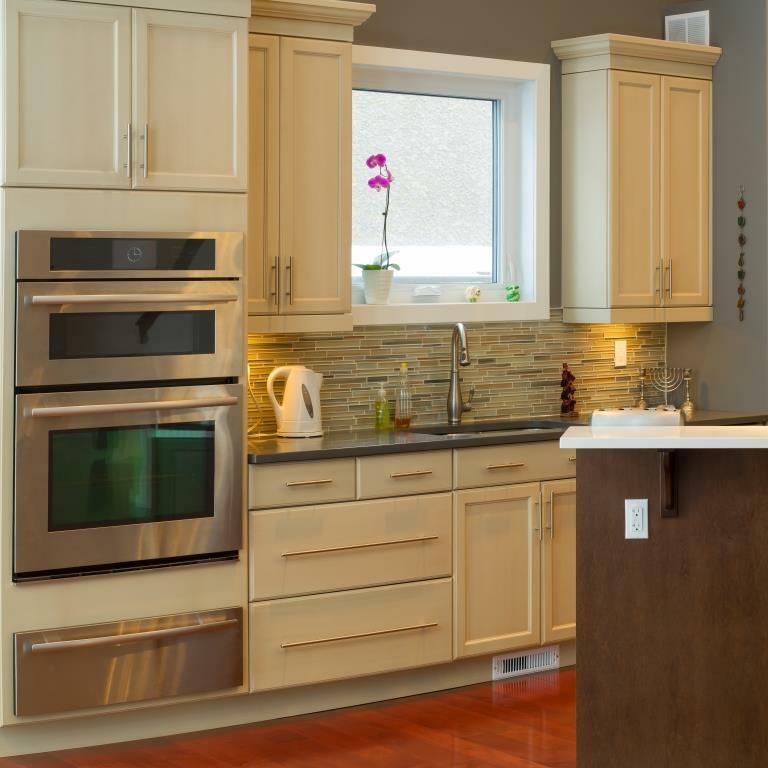 Refinishing Cabinetry takes out a huge amount of material cost for any project. This saves money for the homeowner and for the business. This is the main reason refinishing cabinetry is so much more economically sound than refacing or replacing, the other two options when discussing cabinetry renovations. Refinishing cabinetry is mostly labor cost, while Refacing and Replacing has TONS of material cost to add on top of the labor cost. The final factor that comes into play when ensuring the quality of Refinishing is the person/company you chose to perform the work. The products and processes needed for a high quality, factory finish look are to be done by a professional. Taking doors and drawers off site, providing spray finishes, adequate quality control, hardware relocation, layout modifications, etc. are all things that truly call for a professional company to make sure it is done correctly. Always be sure to know what steps are needed when working on a set of cabinetry. New cabinets are commonly made now using foreign particle board products combined with expensive refacing material that does not provide quality longevity. Peeling, chipping, and deterioration are all common characteristics of common cabinet installations today. With high quality Refinishing, you will save time and money, while avoiding stress when renovating your kitchen or bathroom.